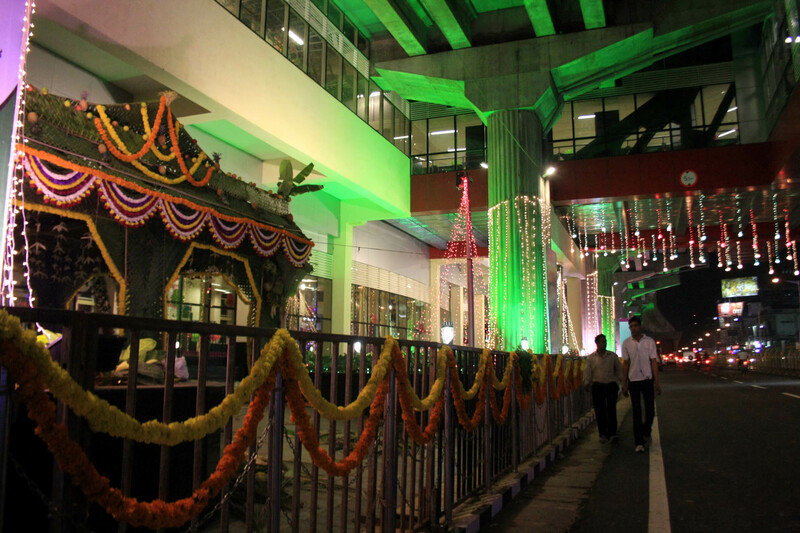 On the night of the morning before Namma Metro rolls out, the M.G. 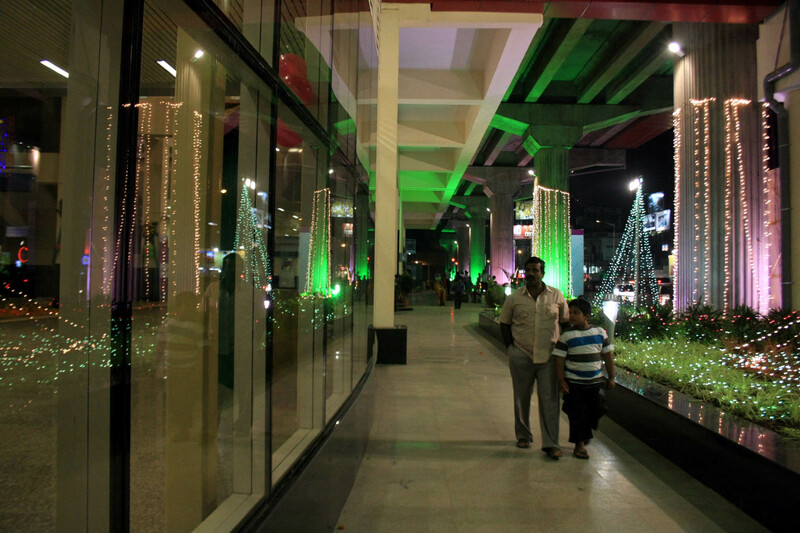 Road station looks all decked up and ready to go as young and old file past to be a part of history in the making. Well, it certainly won’t be inaugurated by you-know-who. 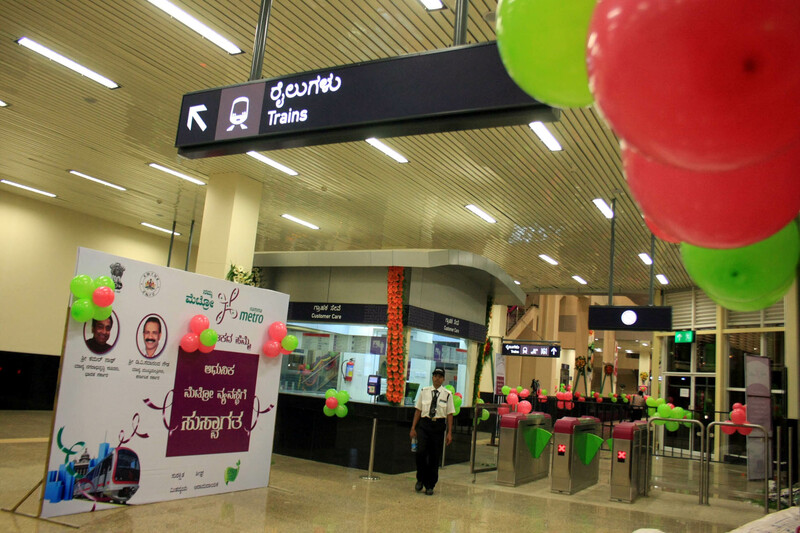 This entry was posted in Issues and Ideas, Kannada & Karnataka, Mysore-Bangalore and tagged Bangalore Metro, BMRCL, Churumuri, Karnataka Photo News, KPN, Namma Metro, Sans Serif. Bookmark the permalink. ← Should gods, goddesses have caste identities? With all the obscene expense on political publicity instead of long-term security for daily middle class passengers…. Well, enjoy the facility while you better take care of your life or that of your kids and friends…! Hopefully atleast now they’ll fix the roads surrounding the metro work. Especially old-madras road NGEF area, which is such a mess. And also complete other Metro related work fast. The Vijaynagar work has been going on for…. ever! Every thing about Namma Metro is not right from planning onwards. It has been planned by Politicians, for publicity. Instead of going under ground, Namma metro has gone up on ugly concrete stilts, spoiling the skyline of Bangalore.Cleaning up the area will be a permenant problem. Please compare this with Metros in London, Paris or Shanghai, you will understand. No amount of publicity will set right the wrongs. With the available modern technology we could have got excellent tube (metro) railways underground. Even now it is not late if the Government hands over the planning to experts. 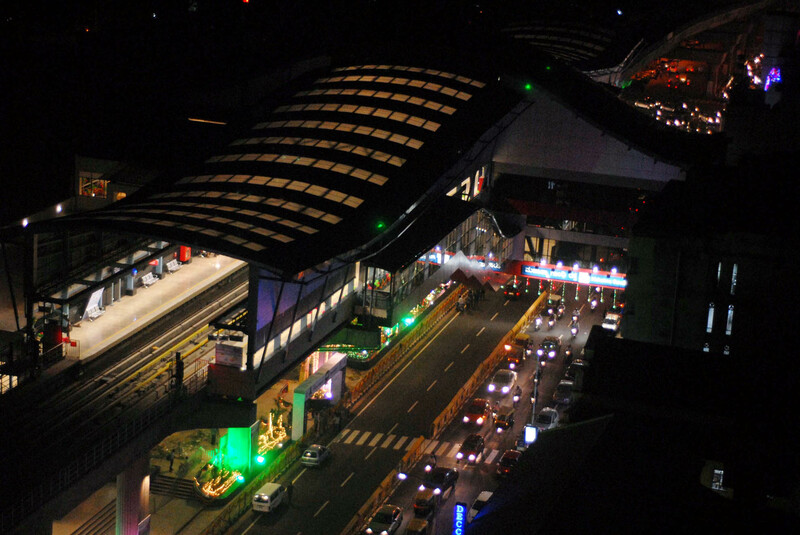 I can see dead dark shadows of huge trees behind that colorful metro station. Even though Metro is very much essential for Bangalore, but still Metro is constructed at the cost of thousands of tress which used to check the air pollution and temperature in bangalore. I was a frequent visitor to Bangalore and Mysore during late 80’s and early 90’s from hot sunny trichy-tanjavore area. During those days, bangalore was like hill station for us, it was an ooty for economically middle class people like me. But now, bangalore is totally polluted, overcrowded and over exploited city. I still feel bangalore should have been kept as it is from the so called devlopment. IT and other services could have well explored some other city of India. Hopefully Mysore doesn’t follow Bangalore and we wont see another Metro system at the cost of trees in beautiful Mysore city. 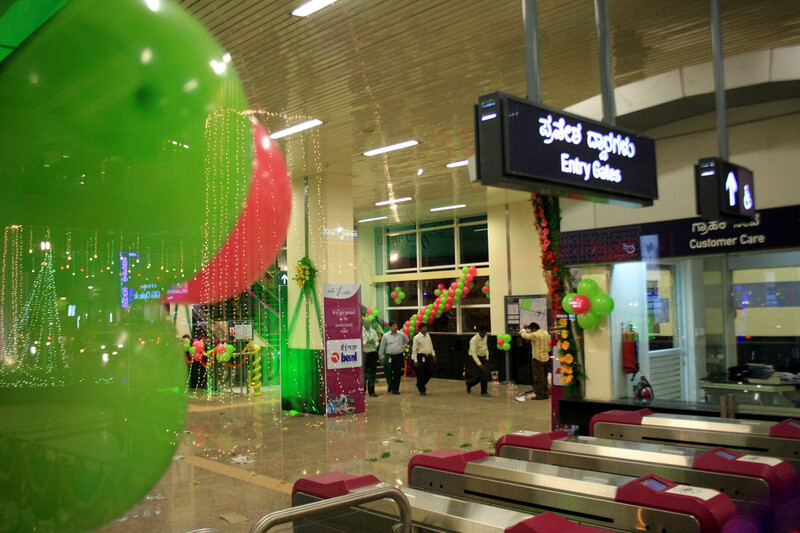 Congratulations Bangaloreans, third city in the country and the first in South India to have a metro rail!! This historic small but significant step should eventually lead to reduction in traffic, pollution and improved connectivity and reduce travelling time once all the reaches/phases are started, which would make the metro popular mode of transport. “But now, bangalore is totally polluted, overcrowded and over exploited city. I still feel bangalore should have been kept as it is from the so called devlopment. IT and other services could have well explored some other city of India”. These are what we call the cons of industrialisation and development. It is not only unique to Blore but to other cities as well. If Blore were to be left out, as you say, some other city would have borne the same brunt. This oft repeated quote, to me atleast does not make any sense. If you haven’ t, then come and see how Mysore is now, it is not the same beautiful city that it was, “once upon a time ago”. It will not be what it is now say 20 years from now. 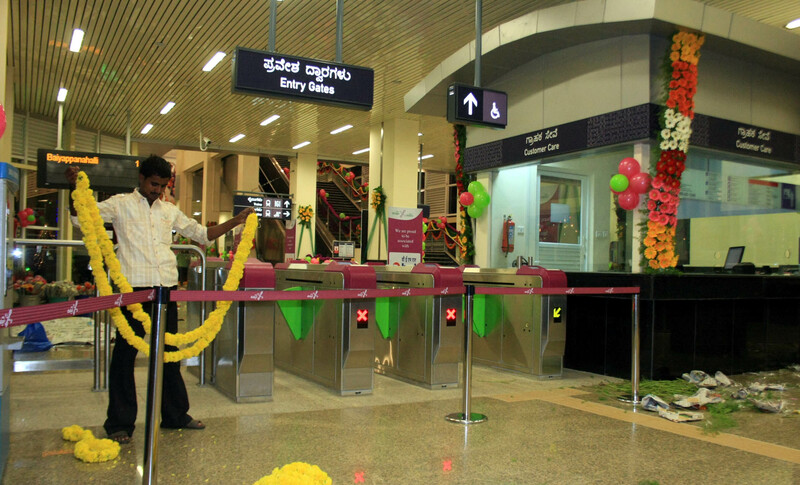 Today Namma Metro in Bangalore has just taken baby steps, with completion of all reaches and phases,in due course, hopefully it should reduce pollution, traffic and improve connectivity in Blore, which then it would have met its objective. It is better if metro is planned and excuted for Mysore now, rather than having to do it, when the need is acutely felt. I fully agree with Arrow,who has nicely analysed.Yes-Mysore compared to Bangalore is calm,sleepy,less polluted,slow.So was Bangalore in 1965,when I setled down there for employment.Having relocated back to Mysore, I am seeing the same urbanisation,tree felling etc making Mysore a busy,vibrant city with opportunities for the local youngsters seeking careers.It is most welcome and no one should grudge.Also Mysore is expanding towards Nanjangud,Hunsur etc.So it is all the more important to plan and execute Metro now itself [overground or underground] as it will make outlying areas easily commutable, with low pollution levels.I am sure fellow bloggers of this forum will concur with my view that focusing towards development of Mysore, the city needs a Metro.